Walk the hallways of Merry Oaks Elementary School and listen. Children’s voices rise and fall as they play vocabulary bingo or a game about verbs. Laughter punctuates the lessons. There is the scramble of feet as one of the lead teachers in a nearby classroom announces a snack break. Music filters from another classroom where children dance the “Hokey Pokey” and learn the correct English names for various body parts. Then, take a drive over to Pinewood or Montclaire Elementary School and hear the same sounds repeated. I guarantee you will leave with a lighter step and a smile on your lips! This is the fourth year that International House has offered a summer Youth English Tutoring Program (YETP) to children in Charlotte who struggle to keep pace with their peers due to limited English proficiency. Many children in the CMS school system lose language proficiency over the summer while staying at home in a non-English speaking household. In Mecklenburg County, 13.5% of the County’s residents are foreign-born, and enrollment of language-minority students in the CMS system is at an all time high. CMS does not currently offer ESL summer programs for elementary school children, although there are programs at the middle and high school levels. 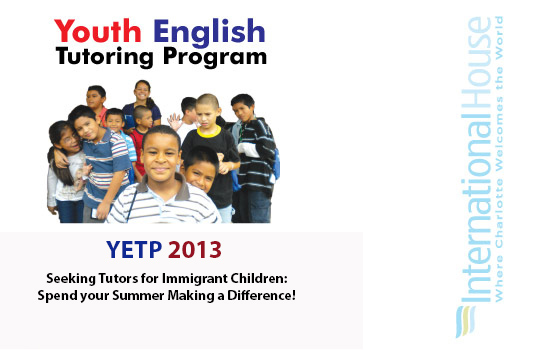 International House’s Youth English Tutoring Program (YETP) helps fill the gap by providing free English tutoring during the summer break for low-income immigrant children who do not speak English at home. YETP has blossomed through the years. Our initial pilot program was offered during the summer of 2010 and assisted 36 children with English language skills in a 3 week program. In 2011, International House began a partnership with Charlotte-Mecklenburg Schools to better identify students most in need of English tutoring and to offer the program on-site at a local elementary school. There were 106 participants in two three-week sessions. Last year (2012), the CMS partnership was further expanded to include two schools, 145 students, and more instruction hours (six week instead of three week sessions). Our current program is now taking place at 3 elementary schools with over 200 children enjoying a fun-filled summer of learning The YETP model matches a trained tutor with small groups of children for a 6 week half-day program. Each of the participating schools also has site coordinators and lead teachers who supervise the tutors and assist with student recruitment, placement and testing. The site coordinators and lead teachers are familiar with the children at each school and can offer individualized attention to a child’s particular learning needs. The results are impressive. Test scores show that children do not lose English fluency over the summer but rather increase an average of 15 to 25%. And, perhaps just as importantly, the children receive the encouragement and support of adult teachers and mentors who believe in them and encourage them to succeed. International House is extremely grateful for the support of the funders who have made YETP possible: the Belk Foundation, PNC Bank Foundation, and the Duke Energy Foundation. Kudos should also go to Education Director, Gail Johnson, whose passion, enthusiasm, and community connections have played a large part in YETP’s ongoing success. For many children in Charlotte, the chance to attend a fun and educational summer camp is a distant dream due to cost and transportation barriers. YETP is a dream come true for over 200 children are learning to love English, as well as their new home in America.